A good designer tee shirt is unique. While you can purchase cheap clothing and do t-shirt printing yourself, you’ll find that designer tees offer some facets that lower quality fabrics and designers simply do not possess. Here are four quality designer tee shirts. Ed Hardy offers some of the highest quality tee shirts on the market. The fabric is soft and flexible, a welcome change from rough cotton garb from clearance aisles. The color of this particular shirt is a deep wine, complete with a v-neckline. Two Koi fish decorate the left hand corner of the shirt, creating a basic, core ensemble. 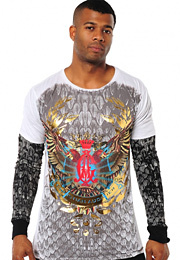 Ed Hardy tee shirts are known for their ability to become the foundation of an outfit. You can literally build around these shirts. You can dress them up or dress them down and the effect is still the same: awesome! Christian Audigier is a Los Angeles based designing company that specializes in providing high quality clothing – especially designer tee shirts. This tee shirt, although marketed to be sold for men, also looks great on women. Dark sleeves have been layered underneath the basic tee shirt, adorned with a normal neckline and a stained white background. The graphic pattern is a winged reptile, complete with rhinestones. The quality of the fabric is outstanding. It can be worn with sweatshirts, hoodies, leather or denim jackets, or by itself. Either way it is one of the best examples of an awesome designer tee shirt. Paco Chicano is a branch of Christian Audigier that specializes in tee shirts that are specifically directed for a Latino market. The colors are festive and bold, the quality very good. This raspberry fling v-neck tee shirt is perfect for casual or dress occasions. The soft black fabric is decorated with off-white patterns around the shoulders and neckline. There is bold, golden lettering on the front of the shirt, surrounding a rose with raspberry roots. The green, red and gold color combination looks really well together. There are two roses printed on the sides of the shirt, as well. It’s a must-have for casual-chic lovers. The Same Guy designs basic clothing for both men and women. Their tee shirts are incredibly soft. The fabric has the feeling of a shirt that has been “broken in,” over a long period of time. 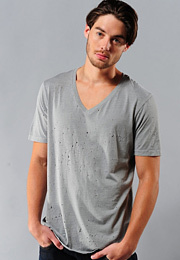 This Heavy Weight Jersey Destroyed tee shirt is a smoky gray hue with patches that look like it’s been dragged through a briar patch. This is intentional, of course, and gives such a basic tee shirt a great, edgy style. It can be dressed up or down extremely easily – plus, it’s really comfortable to wear.